We’ve reached Friday again—January 19, 2018—and the high temperature will at last rise above freezing in Chicago (it’s now 28° F: -2° C). It’s National Popcorn Day, and in the Indian state of Tripura it’s Kokborok Day, celebrating the local language. On this day in 1829, Goethe’s Faust: The First Part of the Tragedy, was first performed. In 1853, Verdi’s opera Il trovatore was first performed—in Rome. Two electricity innovations occurred on January 19: in 1883, the first overhead-wire electrical lighting system, devised by Thomas Edison, began service in New Jersey; and in 1915 Georges Claude patented the neon discharge tube (neon lights) to use in advertisements. On January 19, 1920, the American Civil Liberties Union (ACLU) was founded. In 1940, according to Wikipedia, “You Nazty Spy!, the very first Hollywood film of any kind to satirize Adolf Hitler and the Nazis premieres, starring The Three Stooges, with Moe Howard as the character ‘Moe Hailstone satirizing Hitler.” In case you’re curious, here’s the entire 18-minute short. The big question is: would Dan Arel punch Moe? On this day in 1953, the majority of television sets in the U.S. (73% of them) were tuned to the show “I Love Lucy” for the episode “Lucy Goes to the Hospital“, in which Little Ricky was born. On this day in 1978, the last VW Beetle made in Germany left the plant in Emden. Production of the Beetle continued in Mexico until 2003, but, sadly, they’re no longer made. In my youth I spent many hours standing by the side of the road with my thumb out, watching for a Beetle—or, better yet, its larger cousin the Volkswagen bus—to come by; the probability that they were driven by fellow hippies, and would give me a ride, was high. Did any readers have a Beetle, or still have one? Finally, on this day in 1983, the Apple Lisa, Apple Inc.’s first personal computer with a mouse and a graphical interface, was announced. Musial batted .331 over the course of his career and set National League (NL) records for career hits (3,630), runs batted in (1,951), games played (3,026), at bats (10,972), runs scored (1,949) and doubles (725), his 475 career home runs then ranked second in NL history behind Mel Ott’s total of 511. His 6,134 total bases remained a major league record until surpassed by Hank Aaron, and his hit total still ranks fourth all-time, and is the highest by any player who spent his career with only one team. A seven-time batting champion with identical totals of 1,815 hits at home and 1,815 hits on the road, he was named the National League’s (NL) Most Valuable Player (MVP) three times and led St. Louis to three World Series championships. He also shares the major league record for the most All-Star Games played (24) with Hank Aaron and Willie Mays. He also became noted for his harmonica playing, a skill he acquired during his playing career. Known for his modesty and sportsmanship, Musial was selected for the Major League Baseball All-Century Team in 1999. In February 2011, President Barack Obama presented Musial with the Presidential Medal of Freedom, one of the highest civilian awards that can be bestowed on a person by the United States government. I believe he still holds the record for hitting five home runs in a single day—in a double header. Here’s a 5-minute summary of his career (yes, the video does work). Obama’s encomiums for Musial begin at 2:32. Finally, on this day two years ago, ecologist Richard Levins died; I knew him slightly and his office at Harvard’s main campus was on our floor in the MCZ. Levins ran his lab like a Marxist collective (he was a Marxist), and even had “criticism sessions” in which his entire lab would go into a closed room and single out one person to chastise for political improprieties. It was the Cultural Revolution enacted at Harvard! I sometimes saw students leaving these sessions in tears. Hili: I will teach it a lesson! Ja: Ale on leżał sobie spokojnie i nic nie robił. A tweet from Stephen Fry found by Grania. Look at that determined kid! This entry was written by whyevolutionistrue and posted on January 19, 2018 at 6:30 am and filed under Gus, Hili Dialogue. Bookmark the permalink. Follow any comments here with the RSS feed for this post. Both comments and trackbacks are currently closed. As a student in the 60s, I had a 60 beetle. It was the most common student car of the time. Pretty reliable and cheap to run, but cold in a Canadian winter, although it always started. Pretty easy to maintain as well, with a little mechanical knowledge. Unlike todays vehicles! Sold it when I graduated and got my first job, to someone who I think made it into a dune buggy. My very first car was a 1972 VW Beetle, German-made, and bright orange. I had it for a year in Panama, of all places, while I was doing a postdoc out there (1987-88). It was a bit temperamental, but it’s the only car I’ve ever owned where I dared tinker with the engine myself. I figured that 1930s technology had to be simple enough that even a novice like myself could handle it. As I remember I usually succeeded in making its performance worse, but at least I tried! (My dad told me that Musial “never questioned an umpire’s call”). And speaking of Musial, I had a VW van in the ’70s that my girlfriend and I used to call “Stan the Van.” Had a couple Beetles in those days, too, and even a little Karmann Ghia coupe for a bit. I learned to drive in a ’64 Bug that my parents owned. Great cars, if somewhat Spartan. They handled well in the snow. ‘Cause the engine (such as it was) was over the rear axle. I heard a story a few decades ago about a husband desperately seeking help in getting his about-to-deliver pregnant wife to a hospital, in a town devastated by a flooded river. The story was that a gas-station owner gave the couple his VW Beetle and told them to just drive it across the river, because it would float. Now, I’m pretty sure that story is pure crap. Even if the car did float taking it out onto a flooded river sounds like a good way to die. But I’ve always wondered, do VW Beetles float? Thanks Ken. Ain’t the internet awesome? They had to recall it and issue an apology … to Volkswagon, not Kennedy. My brain stumbled when it saw Musial played 22 seasons for the Cards, but 24 All-Star games. That made no sense until the mighty Google led me to the explanation that 2 All-Star games were played per year from ’59 to 62. The rationale was that the second game would provide more money for the player pension fund. In other words, they, like most things in sports, were done for one thing – money. They ended the 2 game practice with an agreement reached that more money from the single annual All-Star game would be contributed to the fund. In his brief stint as a playwright, William Congreve gave the world two of the most misquoted phrases in the English language. Both come from his 1697 play The Mourning Bride, his lone tragedy amid his comedies. This is often misquoted as music calming “…the savage beast, but it’s the savage breast (i.e., anger) that is calmed. I don’t think I need to mention the misquoted version. The part of Congreve’s that gets left out of this misquote – the part about heaven – was echoed in the play Faust, in which the eponymous protagonist is offered a choice of devils with whom to make his pact. He asks each how swiftly their rewards can be delivered, and when Mephistopheles promises to be “…as swift as love turns to hate…” Faust knows he’s got his demon. I can’t fault prople for misquoting. “Music soothes the savage beast” is probably the second most frequently misquoted phrase in the English language, surpassed only, perhaps, by “hell hath no fury like a woman scorned”. I find it interesting that they both come from the same play. Congreve’s other four plays were comedies, what we would today call “bedroom farces”. Unfortunately, they were his forté, and when audience tastes turned towards more sophisticated fare, he ended his career as a playwright and spent the rest of his days as one of England’s most celebrated poets of that time. Congreve died five days before his 59th birthday. You can read more about what I had to say about mistaken quotes at this link. I’m confident that Moe Howard could have easily taken a punch from Dan Arel. Besides, by Arel’s logic punching a satirical Nazi should turn him into an actual Nazi because punching has the power to flip your opinions to their polar opposites. Grew up in St. Louis and was huge Stan Musial fan. Holy Cow! That’s Harry Caray as the commentator; beloved Cubs’ announcer. I didn’t realize he shilled for the arch rival Cardinals back in the day. He did. Rumour was that he was fooling with one of the A. Bush’s wives and forced to leave. No idea if true. Yeah, didn’t he say “Holy cow” in this video? I suspected it was Caray. Caray was the White Sox announcer between the Cards and Cubs and had a year in Oakland. I’m sure he was a Bud drinker in St Louis as he was on the north side, but it was Falstaff at Comiskey. My mom had three of them. Two green ones and a white one. I remember the white one barely and one of the green ones. She might have had a couple more before then. She was a hippie but my dad was not. I remember the trunk was in the front of the car and she would put the groceries there. I would wonder why her car had the trunk in the front. After I was three, she was a Volvo girl. Now that she’s “retired” from being a mom, she’s a Lexus girl. I’d like to find a classic Beetle someday and hook it up. Sort of a dream. My dad got a 1954 Chevrolet pick-up truck a number of years back and fixed it up. That’s what I learned to drive stick on. We both almost didn’t make it. The gearshift was on the side and no seat belts. A friend of mine had a hot-rodded Beetle back in the mid ’80s that we had a lot of fun with. His family was fairly well off and no expense was spared on this Bug. It was fully custom inside and out. Bright yellow exterior, very clean modern looking, for the day, white leather interior, including the dash, with a nice sound system. I don’t know what all was done to the motor but, if I remember correctly, it started out life as a 2.0 liter type 4 motor. It had a Porsche trans-axle, and needed it. It also had wheelie bars, and occasionally made use of those too. It ran the 1/4 mile in the high 12s. With enough money you can make anything go fast. This reminds me of high school/college. One of my best friends had a 1994 Cabriolet I believe and then a brand new 1999 Cabrio. She hooked them up like that and would date guys who did the same. We used to go to the Volkswagen show in Englishtown where you could see the most hooked up Volkswagens of every year/model. I’d love to do that someday as mentioned above with an original Beetle. My older brother had a late ’70s Sirocco that was pure fun to drive. Later he had some special edition of the GTI. I never got to drive that, but I rode in it once and it was fun too. Motorcycles are more my thing these days, but I really wouldn’t mind having a Beetle like my friend’s. I had a ’72 that I got slightly used in 1974. I was working on the Acoma reservation at the time. I put 120000 miles of dirt-road country driving on it, beating the snot out of it, and nothing ever went wrong with it, until one day in 1976 the electrical system blew up. I traded it in on a new Rabbit, which I had for four years. When I met John, he was driving a ’63 bus. We sold the Rabbit in 1980, and got another one. We also traded the ’63 bus in for a ’68. The ’68 bus had been made in Germany and was bought by an Air Force family, and shipped back to the states when they returned. We were only the second owners. It had the original warranty book in it, in German, with all the maintenance stamps in it. It was in pristine condition, with one little ding in the upholstery in the roof. We beat the snot out of that one, too, using it for sixteen years as our concession vehicle, until we got a real concession trailer in 1996. My cat VW got away from someone at the flea market, and rode the 25 miles back to our house clinging to the transmission housing (with a stop at the grocery store), hence his name. When I went to the dealership to sign the paperwork for the second Rabbit, there was a 1963 Bug in the lot with 17000 miles on it. It had been traded in by a little old lady’s heir. She had only driven it to the grocery store and back. I asked about it, and was told that they would get more for that than they would for a new one, and that it wouldn’t be around very long. Two hours later I went to pick up my new car, and sure enough, the Bug had already been sold. Also, I found a book on there for how to make some other different ones. Thanks! I didn’t realize you had to assemble it. I’m pretty incompetent at assembly, but I may get it anyway. Oops, I didn’t realize you had to assemble it. Their statement that it ‘assembles in less than 30 minutes’ is rather scary!! Kamikara’s website http://www.geocities.jp/kamikara1967/index.html takes you to a link to videos on assembling this and similar toys. The links are labeled in Japanese, but there’s English underneath: “How to make The Penguin Bomb”. It’s a 15-minute video (with a dreadful short tune repeating itself every 15 seconds or so) on how to assemble the penguin. It seems tedious but not difficult from the initial few minutes that I watched, and there are apparently directions in the kit. The site also has a store, but apparently not for sale outside Japan. $10 from Amazon is not a bad price – Kamikara wants Y700, or a little under $7, in Japan. My wife bought a bran new VW in 1970 and had it for 13 years. A very good car and would have been around much longer had it not been for a kid who ran into the back of it when we were on our way to get the cat out of jail in Hawaii in 1983. Should have said, she paid less than $2000 for the new car in 1970. Pretty sure one of the main things that killed the bug was regulations on exhaust emissions. Requirements were killing HP and VW increased engine size trying to compensate but it just keep getting worse for the little air cooled engine. I think Hitler called it the people’s car? Yes, thank you. I suppose the people’s car today would be the Toyota Corolla. Would you care to translate that one for us. Debendranath Tagore,the Hindu religious reformer, wrong guy, though he did die on this date. You must mean Rabindranath Tagore, the poet, who died on 7 August 1941. No, I didn’t mean Rabindranath Tagore; I know the difference between Tagores. Yes, Rabrindranath was the famous one, but Debendranath was in the same family. My apologies. I didn’t think you were referring to a religious reformer. I learned about someone new by my mistake. I had a ’61 Beetle during school years. It was terrific in Michigan snow because even if you got stuck, a couple of friends could easily free it with a push. One day I rolled it over and crushed my ankle. I don’t remember now if it came with a seat belt or if I had just forgotten to put it on. Nice one and same color as my wife’s bug. I don’t think you would have seat belts in the early 60s. Not required prior to 68. Nice white sidewalls and after-market hubcaps. Same color as my first bug, a ’67. I have a VW Manx dune buggy that I’ve been working on. The old busses are worth a lot of money nowadays. The Three Stooges beat Charlie Chaplin’s “The Great Dictator” to the punch with Nazty Spy. While Chaplin’s dictator speaks German sounding gibberish, Moe’s dictator actually employs some Yiddish phrases,including a few obscenities. All 3 Stooges were Ashkenazi Jews, Moe’s parents being from Lithuania. As such as the video of the little kid going up the stairs and down the slide is inspiring, why did the people filming not show the little kid getting help up the last bit of each step? It very much seems like that’s what happened. But there’s no need for that. The reality of that kid’s situation and his charming smile say it all anyway. 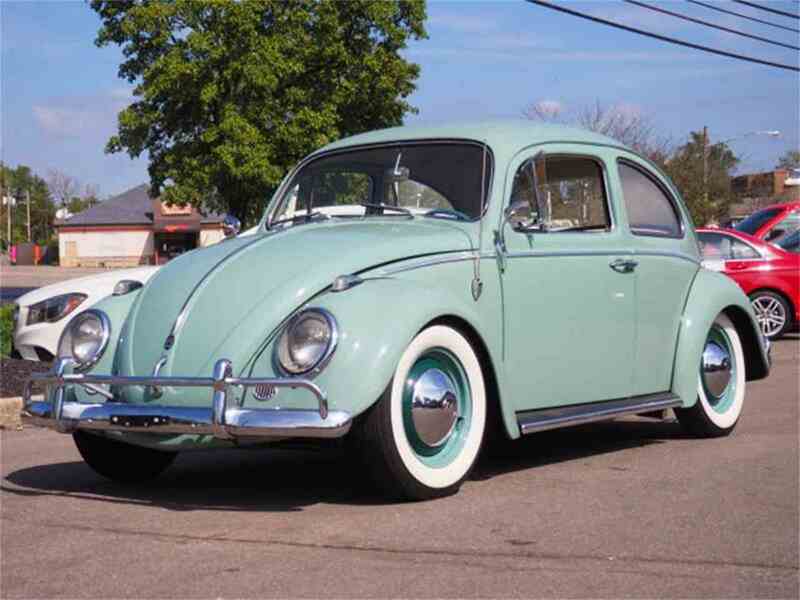 My first car was a 1958 beetle that I took over from my mother in 1974. It had a 1.1L engine and “flipper” indicators that popped out of the door pillar. Unfortunately, I wrote it off 6 months later. My most memorable Beetle was a 1976 model my wife and I rode through Africa (South to North) in 1987. Here we are towing our friends in their Kombi out of the mud somewhere in Kenya. Whoops, meant to type “Wicked Pickett,” as he so appropriately nicknamed. My father bought me a new 1961 beetle. Of course there was no fuel gauge. When you ran out of gas, you reached down to a lever just right of the gas pedal and turned it from up to horizontal. Then you had another 1.5 gallons to go about 45 miles or so. Gas was 30 cents per gallon to do 30 miles/gallon, so one penny per mile. Those were the (school) days. A full tank was about 10 gallons. I remember trying to fumble with that damn lever on the 401 in Toronto! The car suddenly slowing down and the unforgiving traffic made for interesting times. Our gallons were a bit bigger than yours, but cost a bit more, so a penny a mile was about right, as I recall. Also the compression ration was low enough that you could start a VW in gear and it would try to drive away unless you were quick on the clutch. Musial shares the record for hitting 5 HRs in one day with Nate Colbert, who had 5 HRs and 13 RBIs in a doubleheader in Atlanta in 1972. Colbert was a bright spot on an otherwise dismal Padres team. Coincidentally, Colbert was in the stands when Musial hit his 5 HRs.